We had our first snow that stuck this morning, so I felt like going warm for Nail Wheel Wednesday. 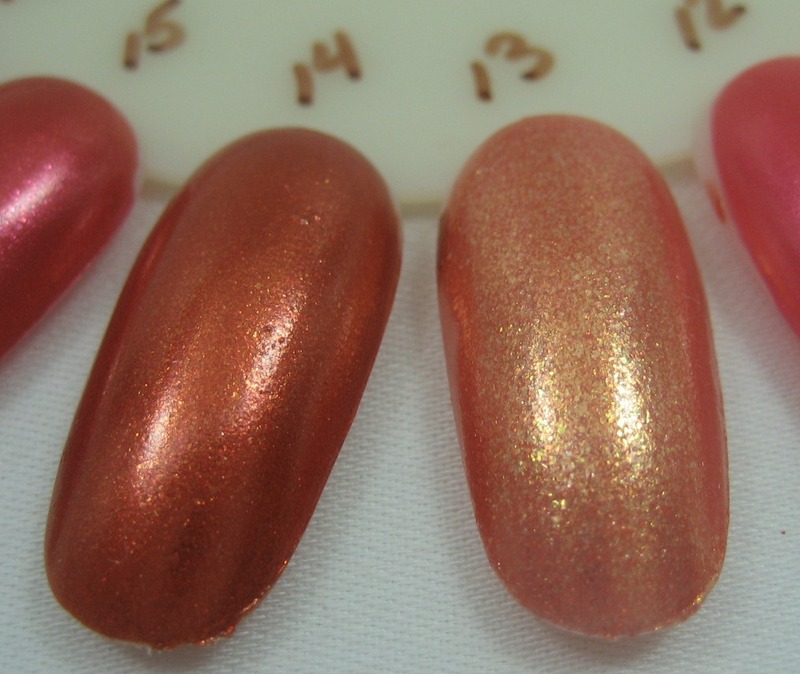 I'm getting to the point in my wheel swatching project that I'm getting close to the end of some colors/finishes (provided I don't buy more, which is always a possibility), so this one has everything from pinky corals to a very deep rust. Don't forget to enter my Season's Greetings Giveaway, if you haven't already done so. SpaRitual is one of the brands I've gotten involved with only recently. 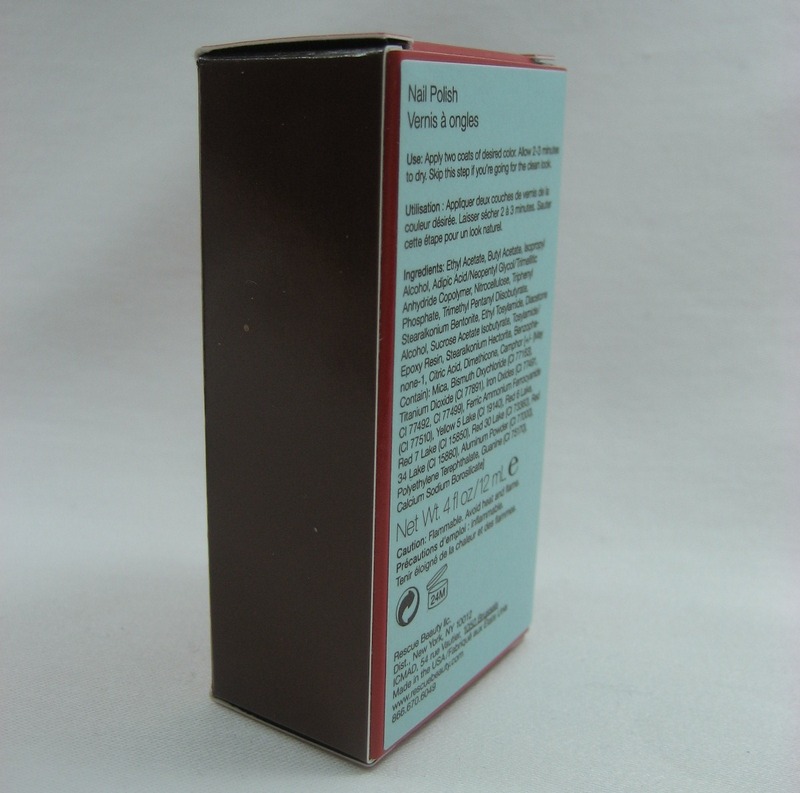 It doesn't seem that widely distributed in the places I frequent; I've never seen it in a bricks and mortar store, and only a couple of my go-to online retailers stock it. I did see SpaRitual swatches pop up in my travels around the blogs and boards and some of those piqued my interest, especially when I read that the brand is affiliated with Orly, one of my favorites, so I ordered some bottles and swapped for a couple more. 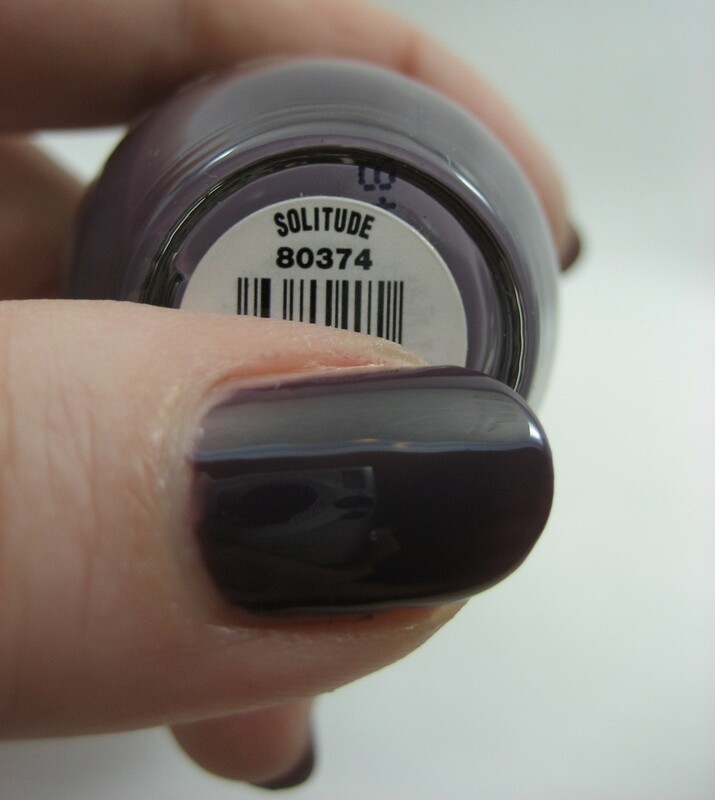 Solitude, a dusty purple creme, is the first one I've tried for a full mani. 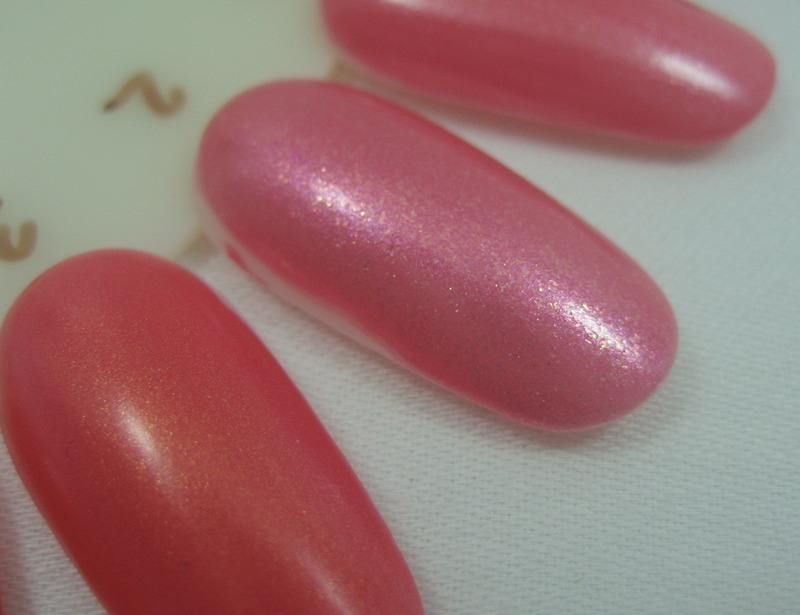 I used two coats of this color, but three would have been better, since I noticed a few thin spots after I got the topcoat on. 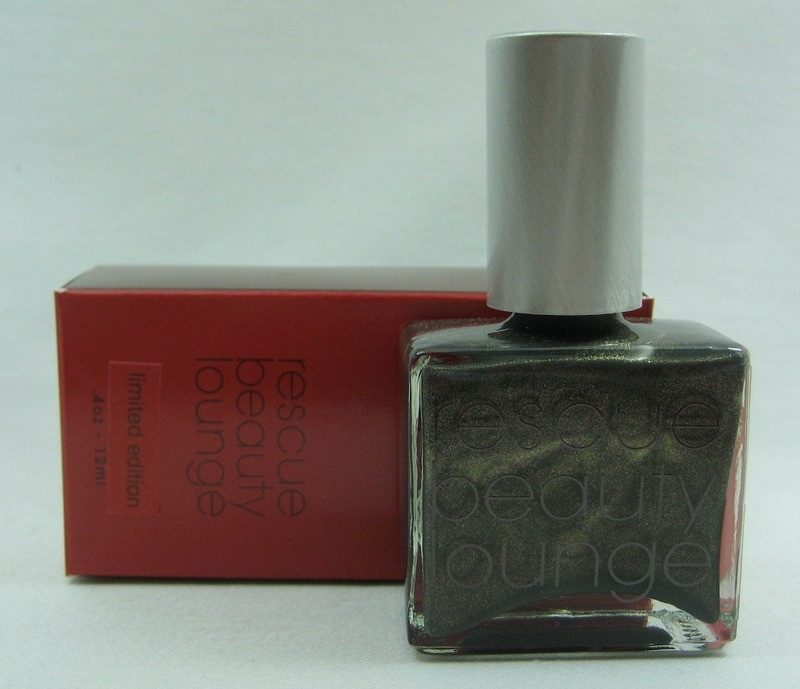 I wasn't as enamored with this one on my nails as I was with it in the bottle; it seemed to lose some of its interesting dustyness. It was fine, really, just not quite what I'd hoped. Maybe it would have been better in the sun, except we didn't have so much sun while I had this on. I wore it by itself for a few days, hoping it would grow on me, but finally had to spice it up with a stamped funky French a la Fingers. I chose the houndstooth design from Konad plate m63. 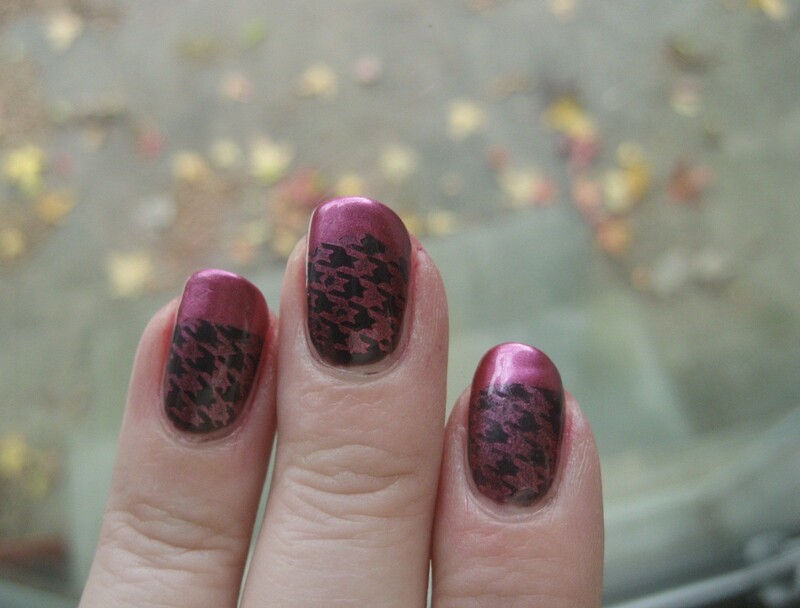 For the stamping, I used Sally Hansen Chrome Nail Makeup in Carnelian Chrome, which I bought from nailXchange's blog sale (which she appears to have extended until today), and which I chose especially for this mani because it was pink and would likely annoy Fingers. What can I say, we just have that sort of relationship. There's a certain amount of wonkiness in both my stamping and my freehand tips, but on the whole I was happy with it, and it was certainly a lot more interesting than Solitude alone. 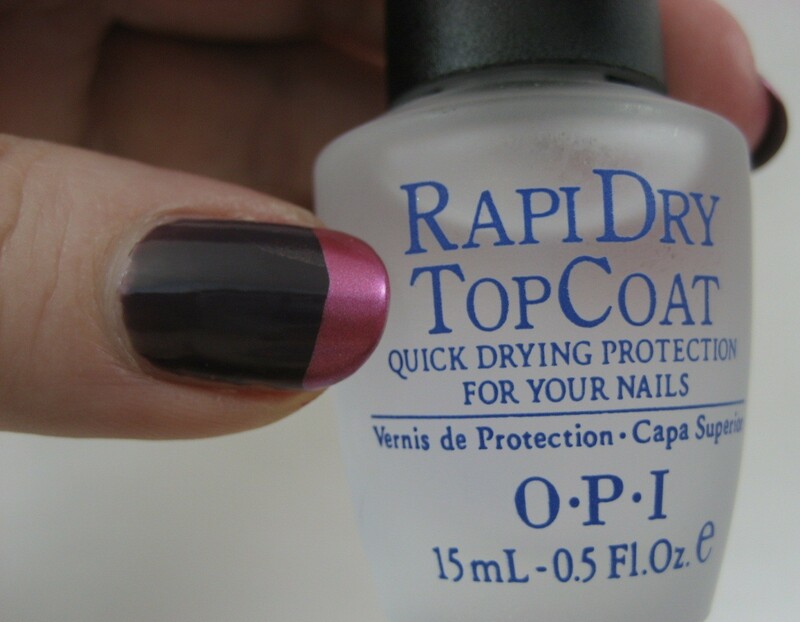 I only did the tip on my thumb to mix things up, and used OPI RapiDry instead of my usual Sally Hansen Insta Dri topcoat to seal on the chrome. 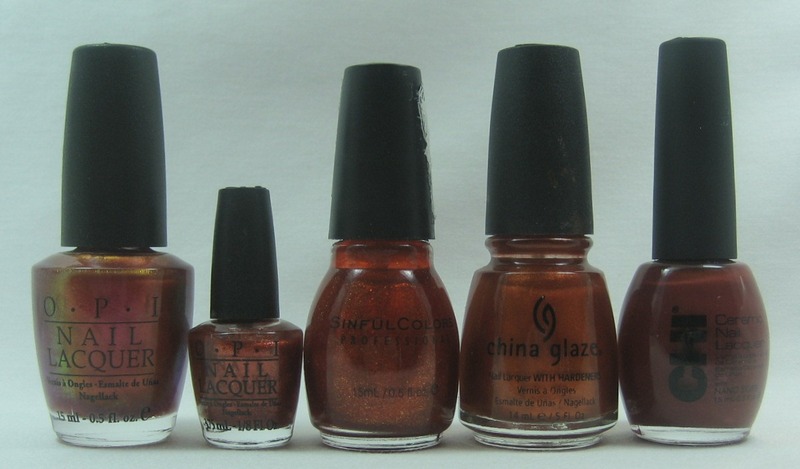 Chromes are something, along with Prisms, I'd like to see Sally Hansen bring back. Sally seems to have a short attention span, so maybe one of these rounds of lines coming and going she'll revisit the good ideas from the past. 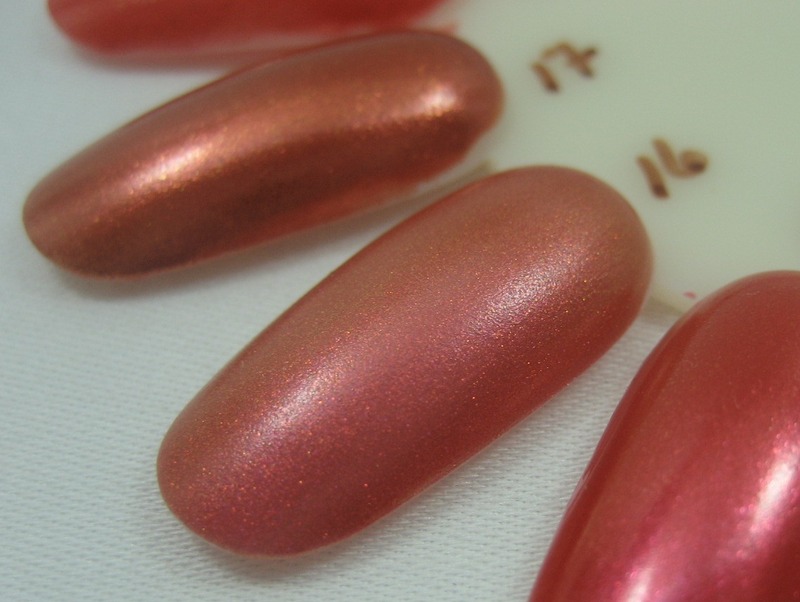 When the chromes were first out, I don't think anyone was stamping, and they're great for that. With Thanksgiving behind us here in the U.S., many of us turn our thoughts to Christmas. Regardless of what you celebrate at this time of year, I believe there's no bad time for free stuff, so I'm giving away a few sparkly things that seem appropriate for the holiday season. Which you probably remember from my last post. 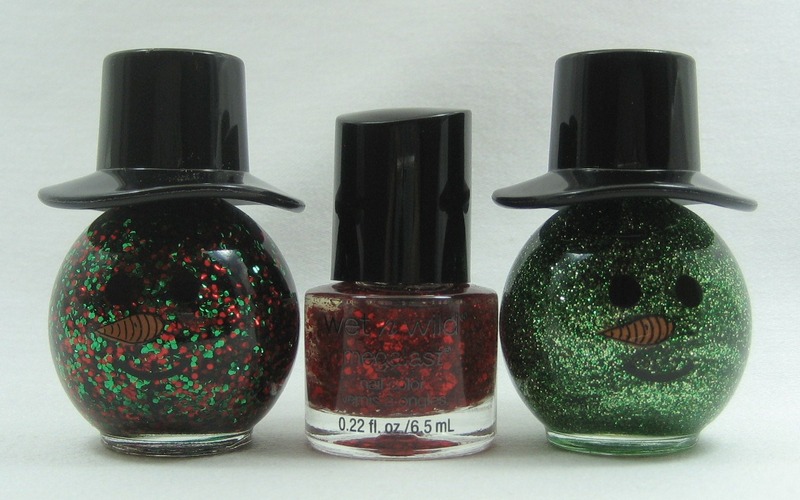 Two of this year's snowmen—a red and green chunky glitter and green and gold microglitter—teamed up with the star from last year's Wet 'n' Wild Megalast holiday collection of mini polishes, Prancer. 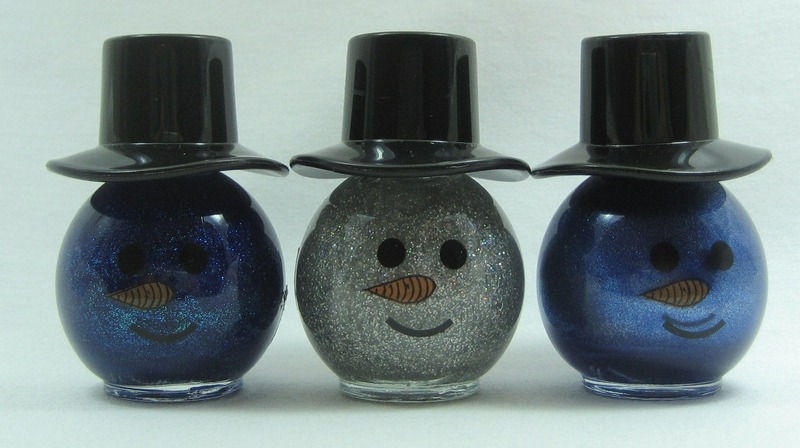 I saved these guys from last year; there's blue microglitter, silver with scattered holo glitter, and blue foil. 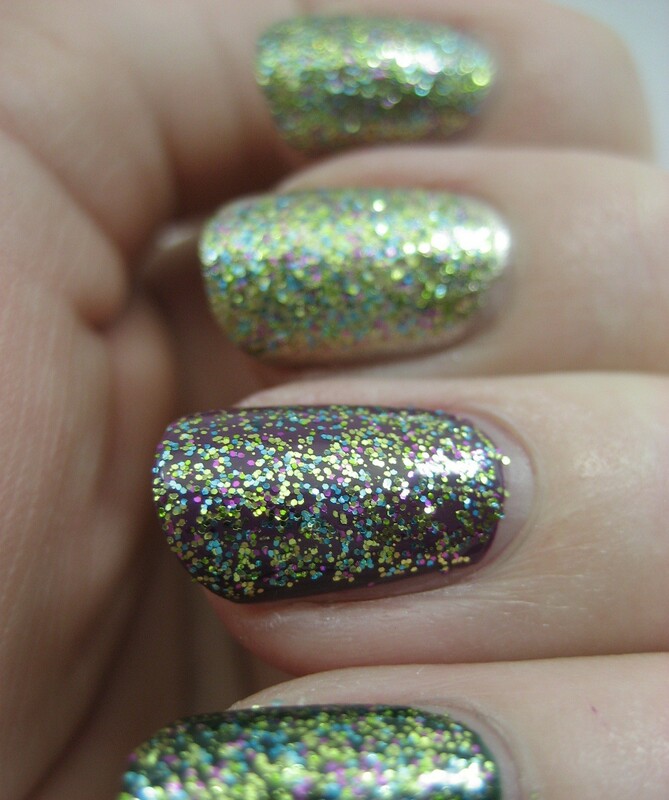 I swatched the silver and the foil here. I feel a little weird about this one, since unlike all the other prizes these are not brand new bottles I bought specifically to give away. These are the bottles I swatched for the comparison post last week. Now that I know I have fine dupes for them, I really don't want these around to remind me that I could have bought something else with that money. I'll feel much better about it if I can send them to a home where they'll be welcomed instead of resented. 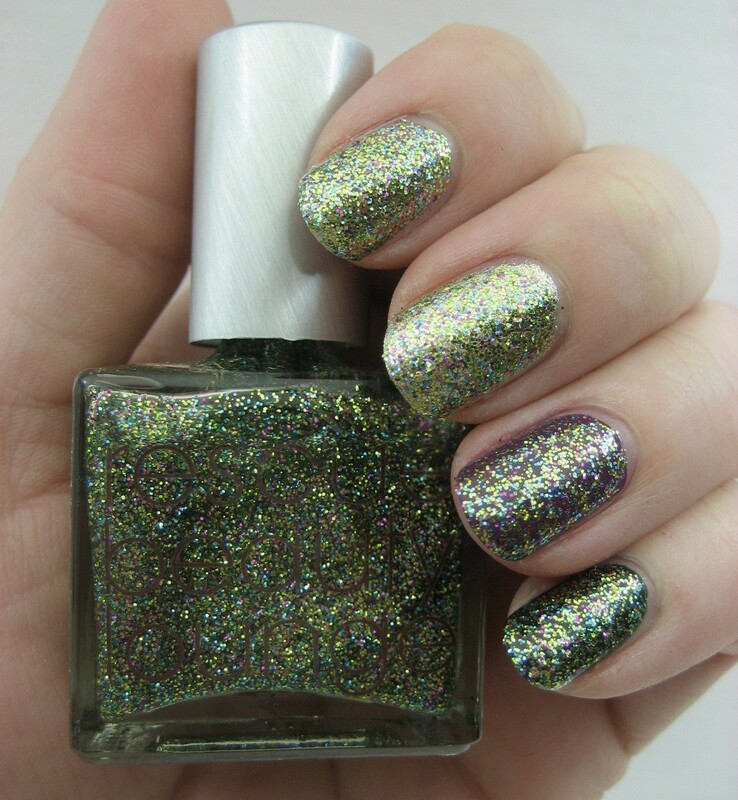 I know not everyone likes glitter (Fingers, I'm talking to you), so here's Anne, the murky-in-a-good-way green shimmer from the Tudor Queens collection. I swatched her with her sister queens here. To keep it simple, as this season of joy, peace, and love can also be a season of stress, all you have to do to enter is tell me your e-mail and which prize is your favorite. I'll choose a winner for each from the names which favorited that prize. International entries are welcome. I'll be closing the contest at midnight in the Eastern U.S. time zone on Wednesday, December 7, 2011. Good luck, and thanks for reading! P.S. 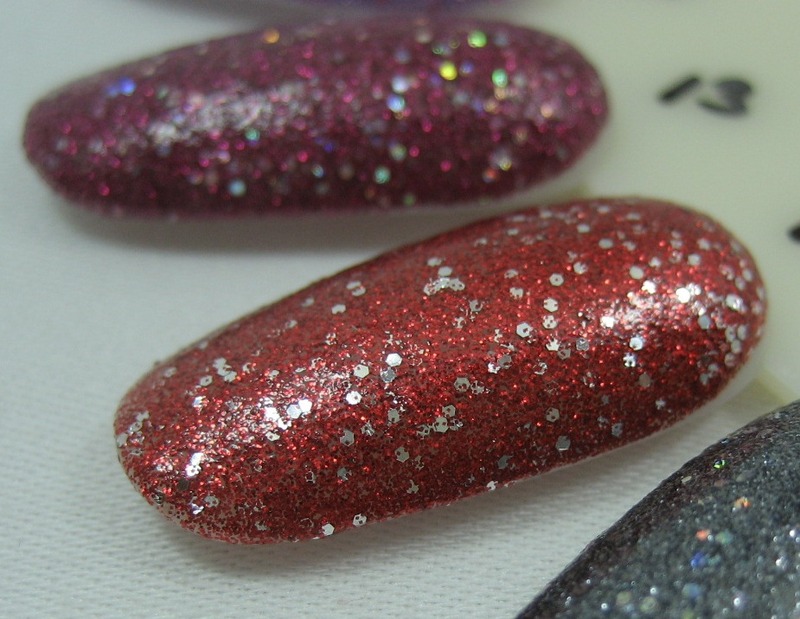 While you're waiting for this prize draw, if you're into glitter, you might want to go visit Beanie's blog sale; she's now got the frankens I swatched here, here, and here on offer. 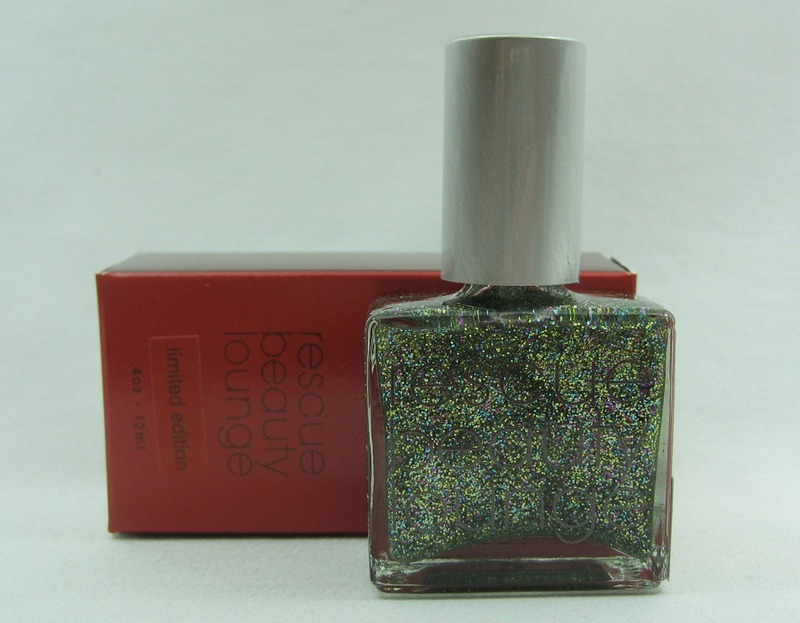 You may remember that way back in April, I got all bossy and told you to vote for Locavore in Rescue Beauty Lounge's Bring It Back contest, because it was the one RBL glitter I did not have and I really, really wanted it. Happily, Locavore was one of the winners, and I ordered it as soon as the pre-order e-mail came. Then there was the waiting, but finally Locavore arrived! 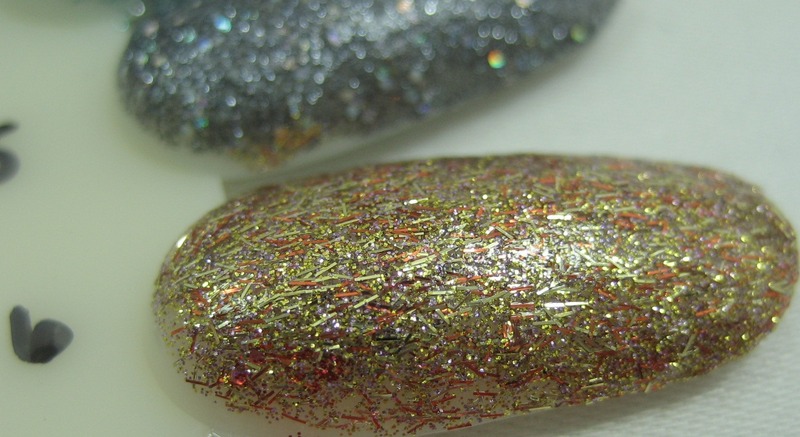 That's more than enough whining about the packaging—the important thing is the polish. I decided to introduce Locavore to some coordinating colors from my stash: Revlon Gold Coin, Sally Hansen Complete Salon Manicure Anemone of Mine, and Sinful Last Chance. 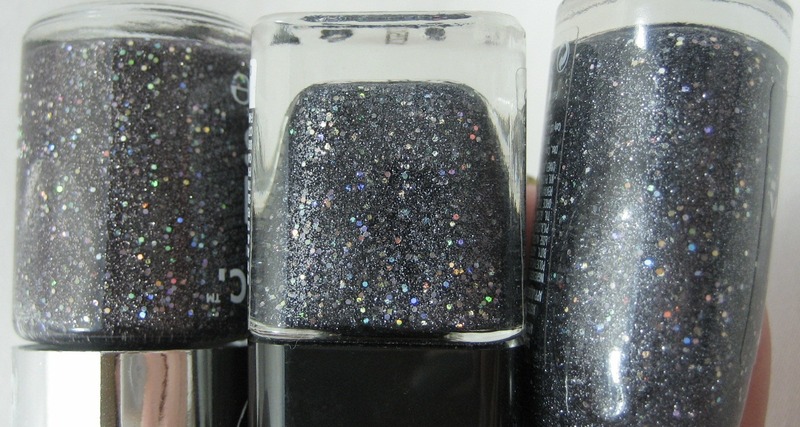 Above, top to bottom: Locavore alone, Locavore over Gold Coin, over Anemone of Mine, and over Last Chance. 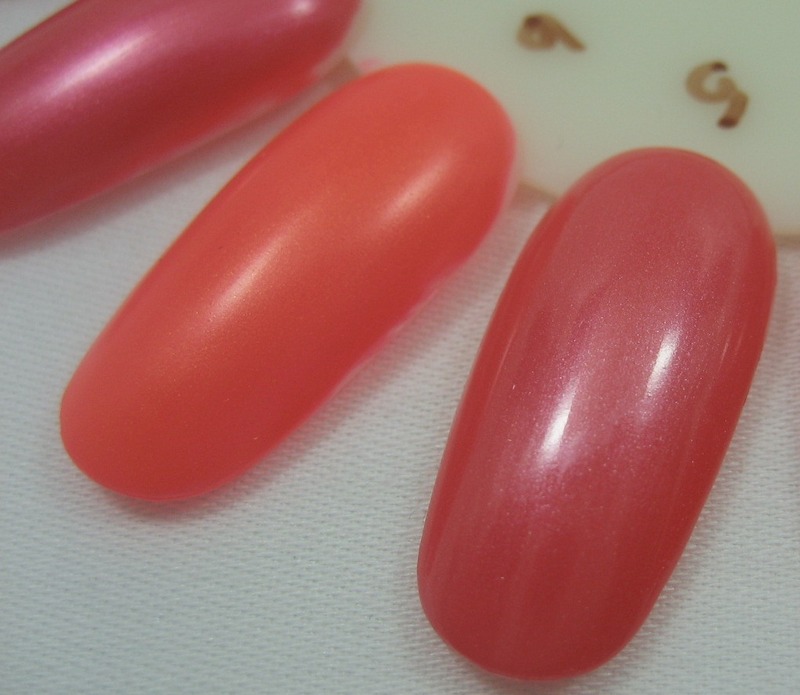 All are four coats with top coat; the layered looks have two of color and two of Locavore. I didn't use base coat because I was just swatching; I will not make that mistake with Last Chance again—I got some serious staining from that one and I wasn't wearing it for very long at all. 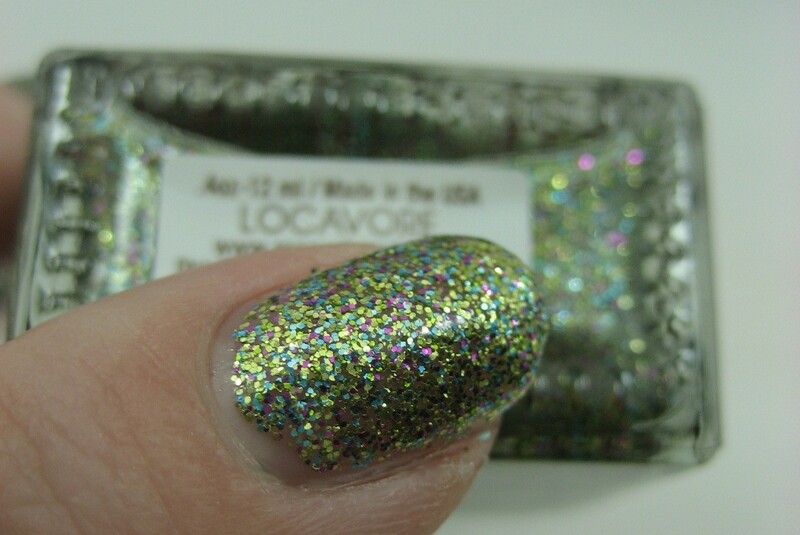 Above is a closeup of Locavore alone; I really felt four coats were needed for maximum bling, but a normal person would probably be happy stopping at three. Using a gold base (as in foreground above) seems like a good way to get the look of pure Locavore without having to do so many coats. 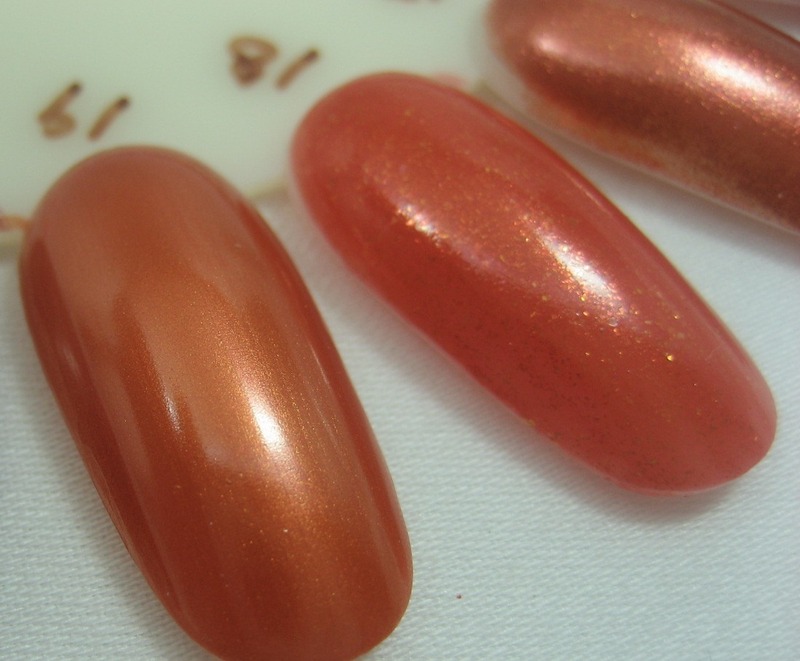 Next time, I might try a yellower gold to better match the gold glitter bits in the RBL. 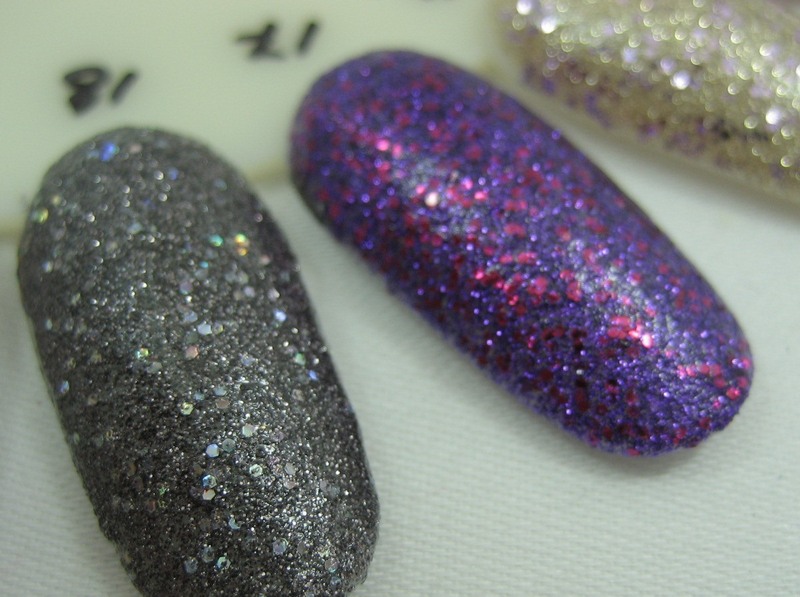 Of course I love it over purple; that lets each of the glitter colors stand out. Deep green is a good base for Locavore, too. I'm so glad I finally have this glitter in my stash! As promised back in April, I did buy an extra bottle of this to give away; it'll be part of my holiday contest which I'll announce either later today or tomorrow depending on how smoothly it goes at work this first day back after the long holiday weekend. Two posts in one day? Believe it. With all the family stuff going on over the Thanksgiving holiday, I'm not planning on posting for the next four days, but I have so many things I want to post that I decided to just get this one done today. 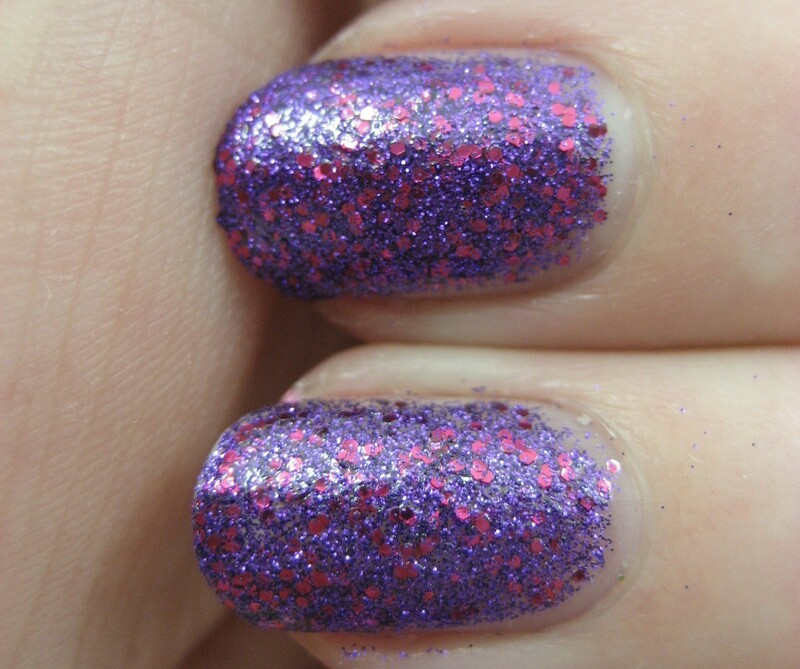 It's a followup the the glitter wheel I posted this morning, with the ones that looked the most dupe-y to me. 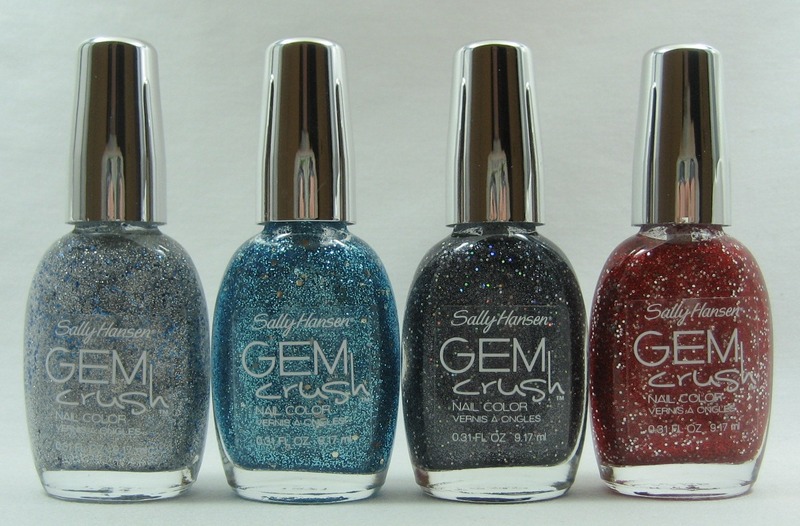 First up, Sally Hansen Gem Crush Be-Jeweled and Wet 'n' Wild Color Icon It's All in the Cut. They look really similar in the bottle, don't they? It's All in the Cut (left), Be-Jeweled (right). 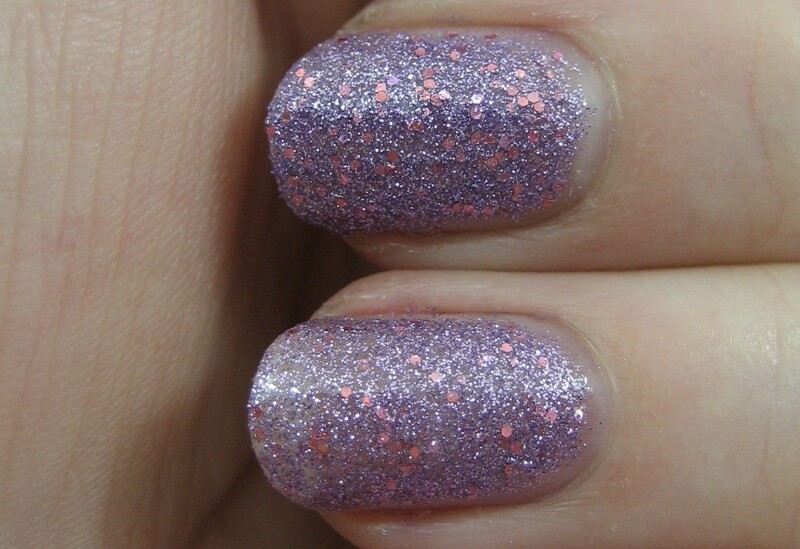 On the nail, the only difference I could spot is that the glitter in the Sally Hansen is less dense. 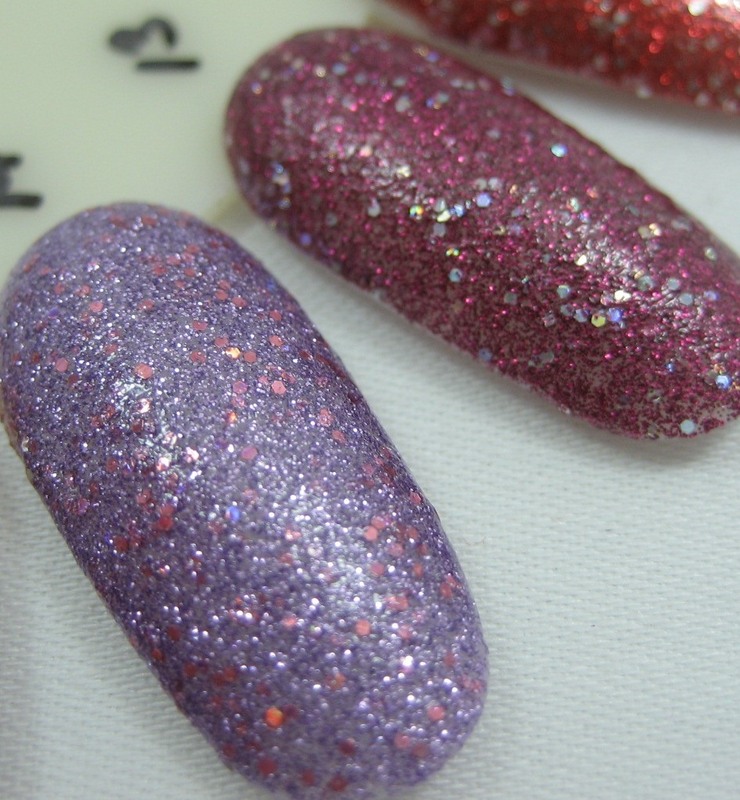 I used four coats of Be-Jeweled and three coats of It's All in the Cut, plus topcoat in both cases. It's All in the Cut (top), Be-Jeweled (bottom). Top to bottom: Be-Jeweled, It's All in the Cut, Be-Jeweled, It's All in the Cut. 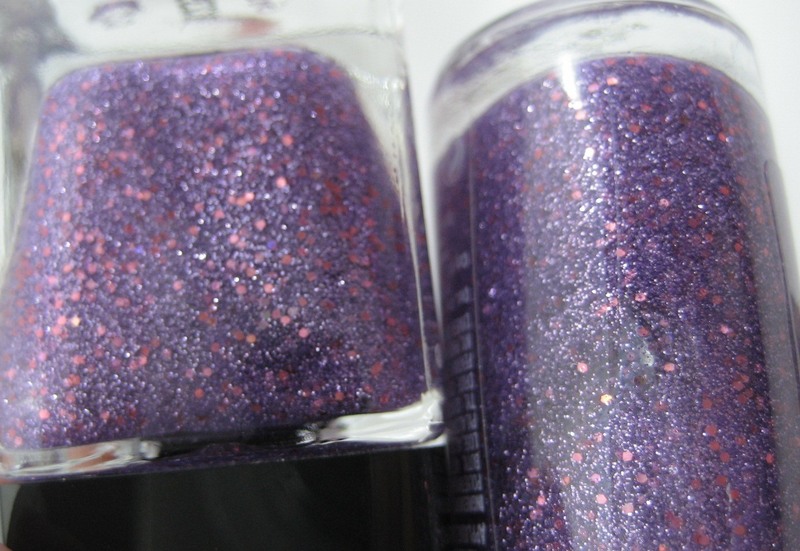 The Wet 'n' Wild wins this battle of the light purple with pink glitter—it's cheaper and covers better. Too bad it's limited edition. 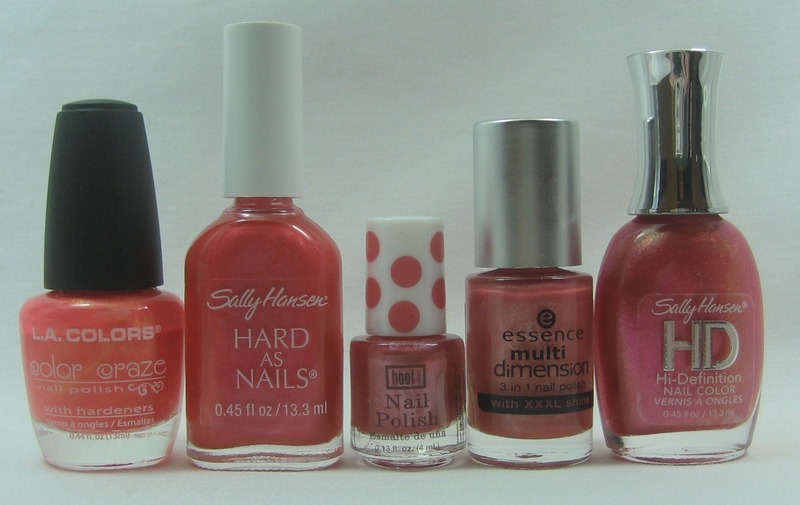 The Sally Hansen is not bad; it will build, and near as I can tell it should get restocked since the display didn't say limited edition (and the bottles have numbers on them with the shade names--usually Sally's limited editions do not have numbers). 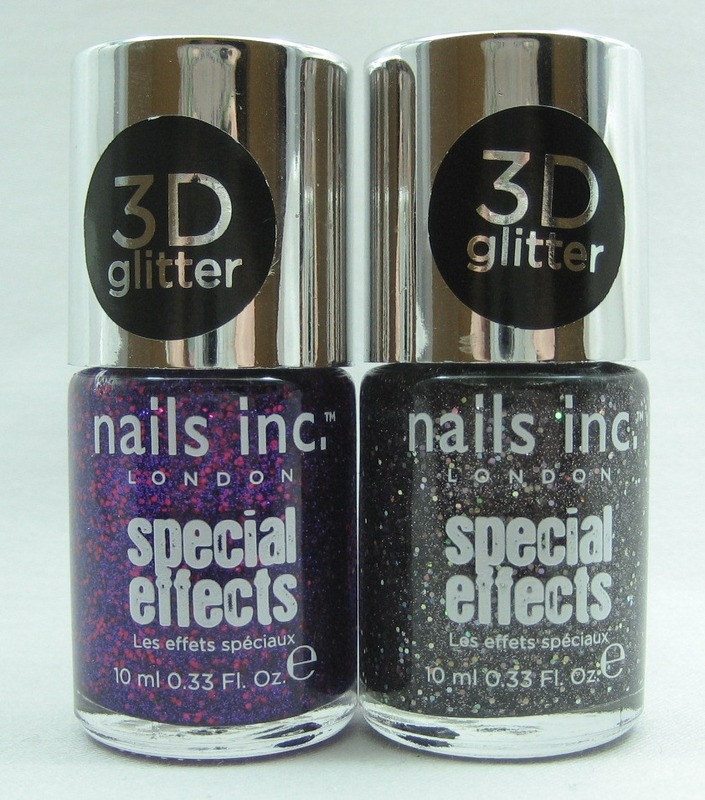 Next up, the purple with fuchsia glitters: Wet 'n' Wild Back Alley Deals and Nails Inc. Special Effects Bloomsbury Square. Back Alley Deals (left), Bloomsbury Square (right). Back Alley Deals (top), Bloomsbury Square (bottom). Top to bottom: Bloomsbury Square, Back Alley Deals, Bloomsbury Square, Back Alley Deals. 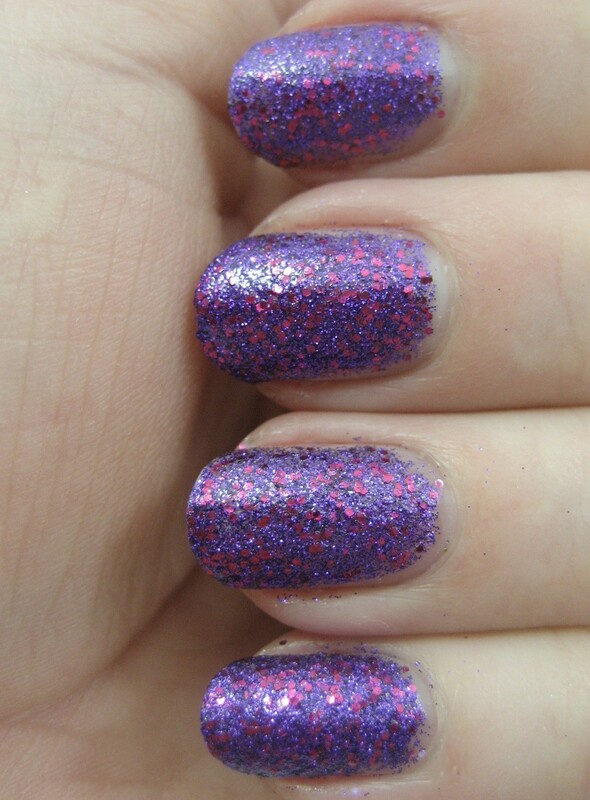 I used three coats of each plus topcoat, and couldn't really tell a difference. 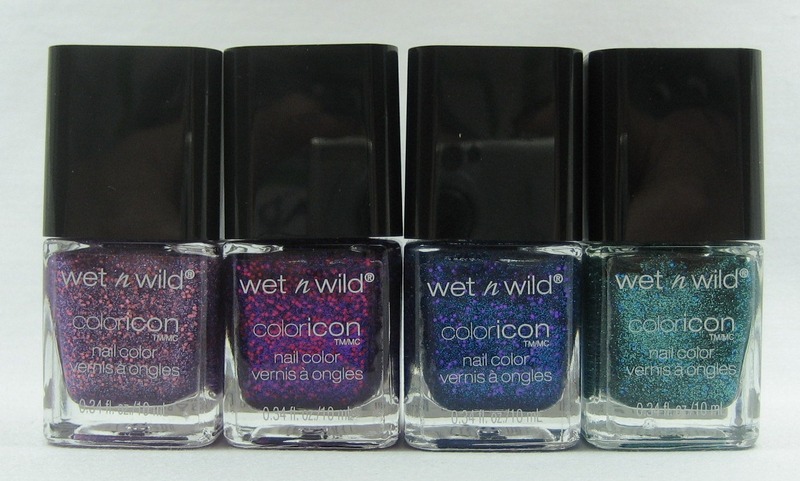 Wet 'n' Wild wins this battle, too, since the Nails Inc. is $9.50 at Sephora versus the $2.99 I paid for the Wet 'n' Wild. 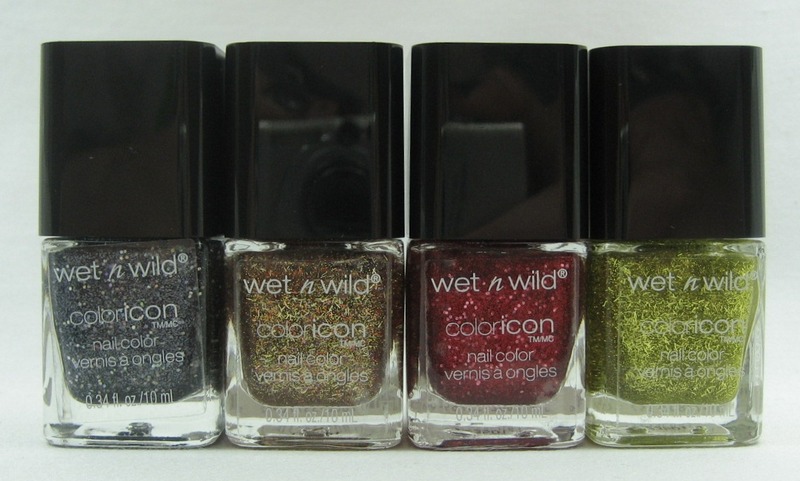 But again, there's the limited edition problem with the Wet 'n' Wild. Why you no make these core, Wet 'n' Wild? 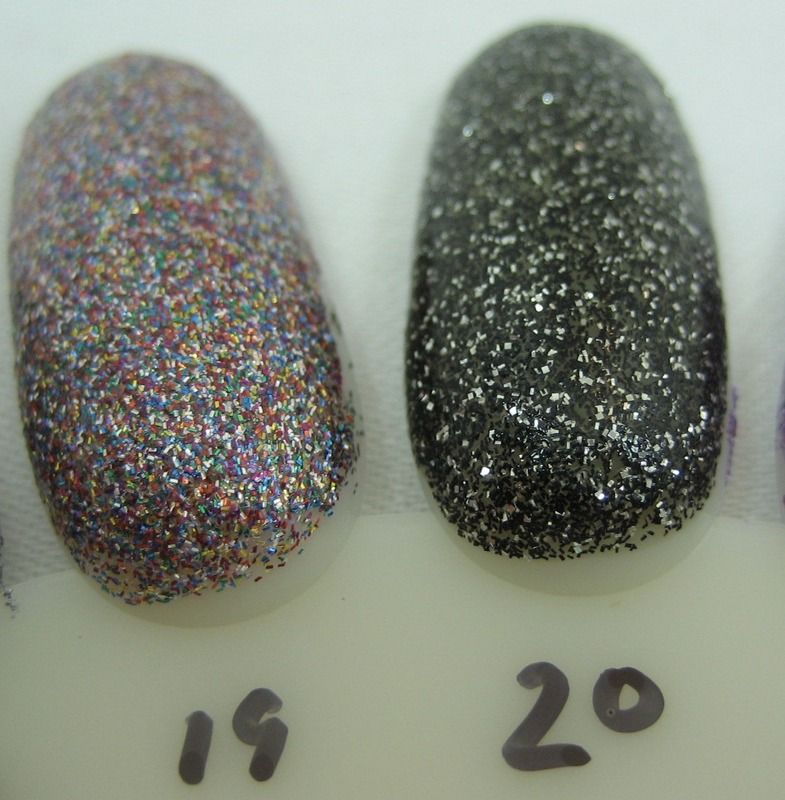 Finally we have Nails Inc. Sloane Square, Wet 'n' Wild Diamond in the Rough, and Sally Hansen Glitz Gal. 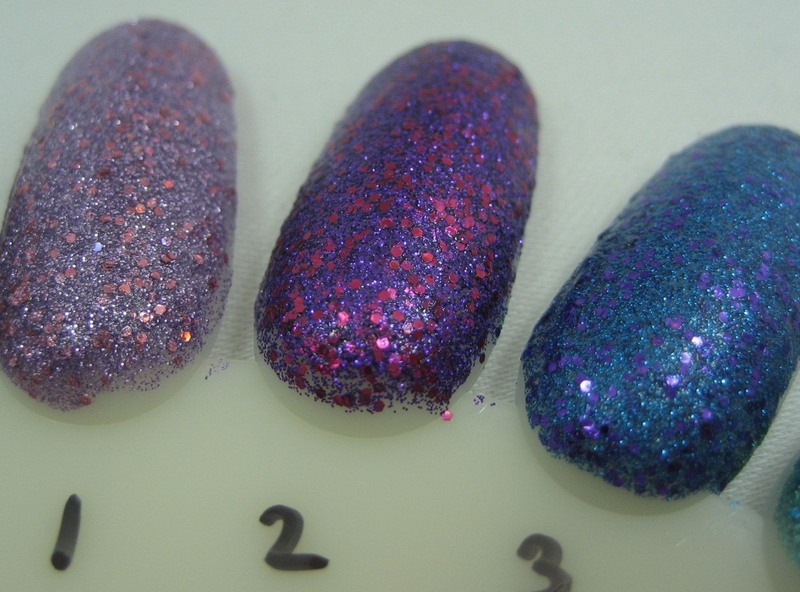 Left to right: Sloane Square, Diamond in the Rough, Glitz Gal. You maybe don't even need me to tell you how this one came out, but I will. 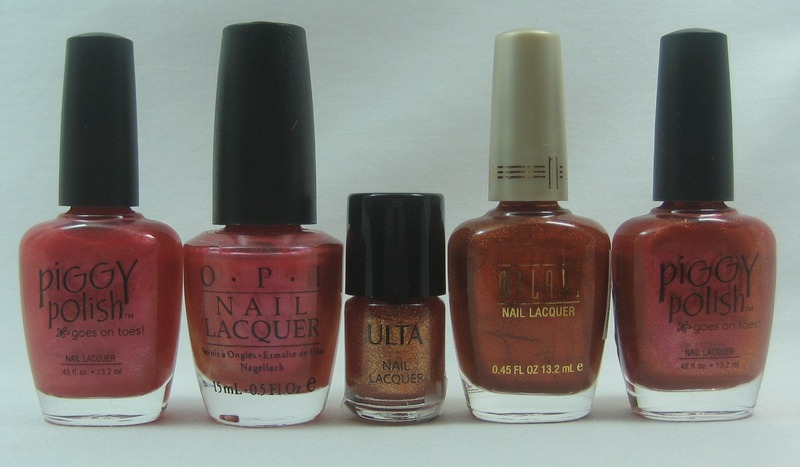 The Nails Inc. and Wet 'n' Wild took three coats to Sally Hansen's four, and even then Ms. Sally was still more sheer than the other two. 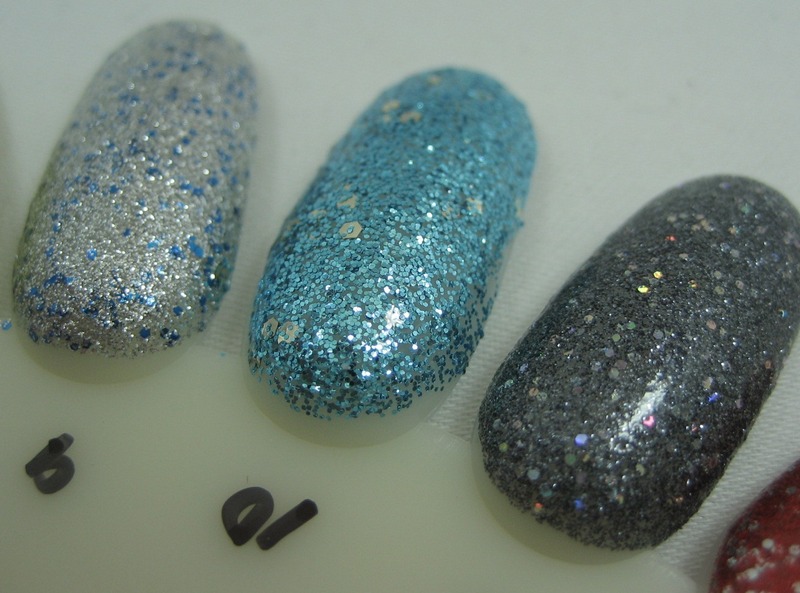 Top to bottom: Sloane Square, Diamond in the Rough, Glitz Gal. 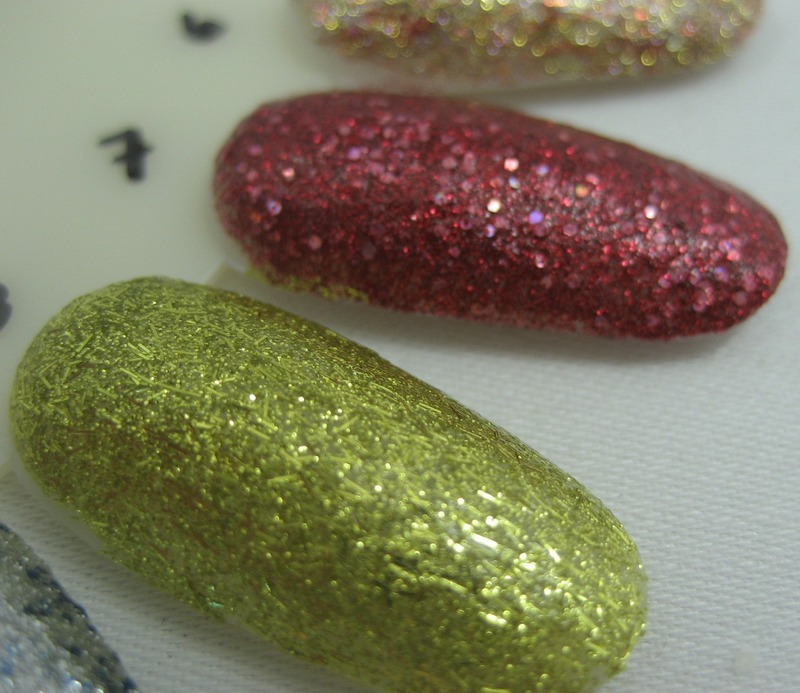 Left to right: Diamond in the Rough, Glitz Gal, Diamond in the Rough, Sloane Square. You can really see by this point that I was getting so aggravated by the fact I'd bought all these dupes in the span of a few weeks that I rushed through cleanup. 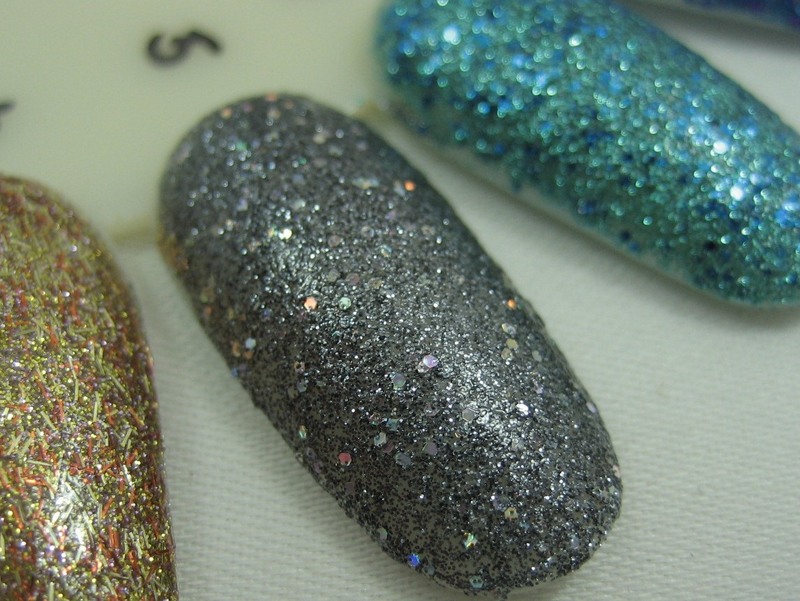 Looking on the bright side of my buying spree, I was able to do this post as a result and at least showed some restraint and didn't get all four of the Nails Inc. glitters. Poking around the web, it appears that Wet 'n' Wild Believe Me It's Real is close to Nail Inc. Connaught Square and Cost Is No Issue is close to Fitzroy Square. 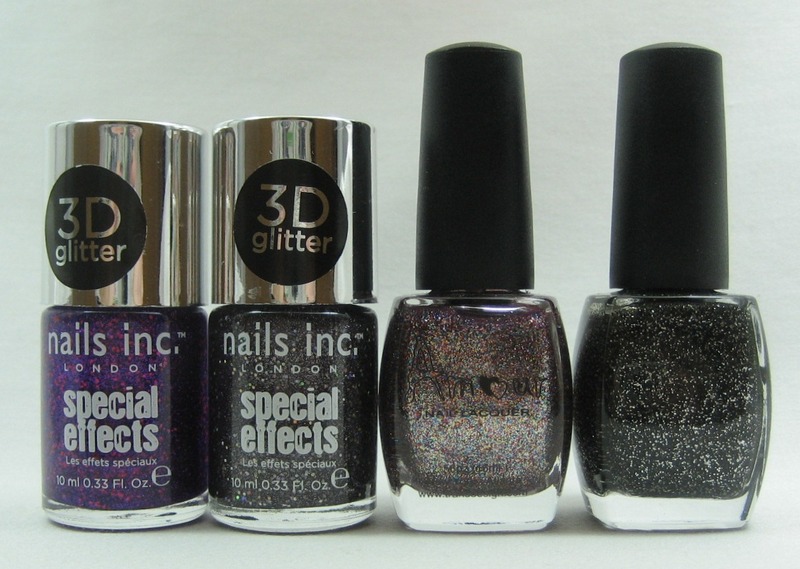 I am glad there are so many glitters coming out but sure wish there were more variety instead of all these dupes. And with that, I am off for the holiday. Happy Thanksgiving to those of you celebrating this weekend! I am thankful for all of you that I've "met" through this blog, and those of you who I haven't had the chance to meet yet but who take time out of your day to read my posts. Without you, this would be 99% less fun. 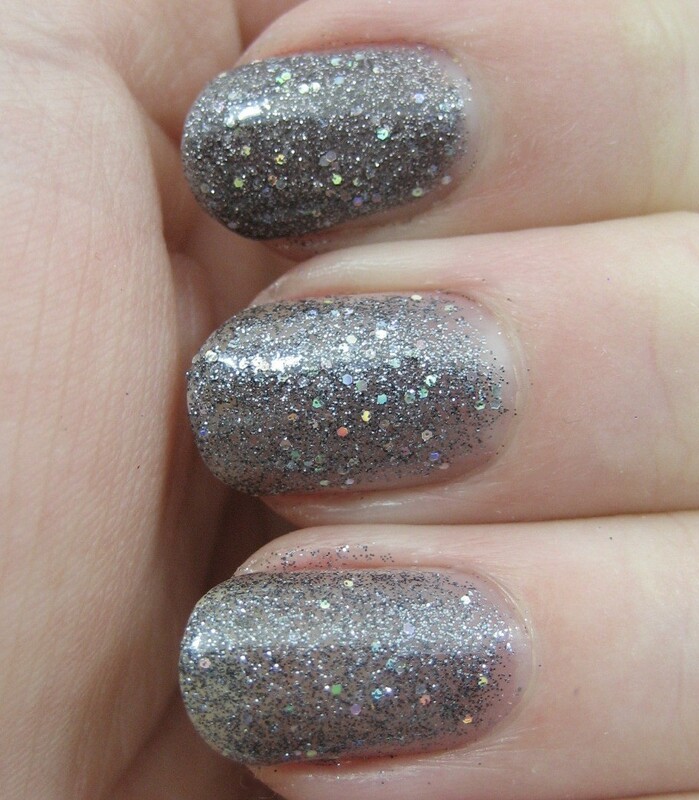 This makes two glittery Nail Wheel Wednesdays in a row, and I'm good with that. Eighteen of these twenty polishes joined my collection in the last month or so, which somehow makes it extra frustrating that there are a few sets of dupes in there. On the positive side, comparing them means I have plenty of material for my next post.